Do your Scooters require assembly? Most Scooters are shipped assembled, in exception to side mirrors, baskets and other items to ensure they aren’t damaged when shipped. Yes, in London Ontario, but it is not opened to the public at this time. All our scooters are covered by a comprehensive warranty. You just need to call us in case you have any problem and we will take care of it. How long can I expect my batteries to last? Some people worry about stability but scooters are hard to tip over. 4-wheelers are more stable, but with a careful driver there should be no stability issues with 3-wheelers. The vast majority of 3-wheeler owners never tip them over. Just as car drivers have a feel for where they can take their car, scooter drivers soon get a feel for where they can take their scooter safely, whether it has three or four wheels. What is a freewheel lever and how do I use it? When engaged, freewheel lever allows your mobility device to be pushed. Your scooter is equipped with a manual freewheel lever. Your power chair is equipped with two manual freewheel levers. Whenever you need or want to push your device for short distances, you can put it in freewheel mode. Pull up firmly on the manual freewheel lever to disable the drive system and the brake system. Push down firmly on the manual freewheel lever to re engage the drive system and the brake system and take your device out of freewheel mode. Will my private insurance pay for a Scooter? You will have to contact your insurance carrier to find out if they will reimburse you for the purchase of a mobility transportation aid. We have been told that some people have been fully or partially reimbursed for their purchase. Do you really ship for free within Canada? Yes we certainly do. Once shipped from our London Ontario location it can take up to 6 to 11 business days depending on the destination province. We ship it by courier. Once shipped from our London Ontario location it can take up to 6 to 11 business days depending on the destination province. How will I know when the product will arrive? When we ship, we provide a tracking number via email. If you do not have an email address, we will call you to provide the tracker number by phone. If you are receiving coverage through Medicare or Medicaid, you may qualify for coverage on a mobility device. You must have a medical need for Medicare to cover the cost of a scooter, power chair, or other mobility product. You should contact your insurance provider to get exact answers to your questions regarding coverage for your specific policy. Can I ride the scooter on the road? The scooter is a “pedestrian mobility device”, and is intended for use on sidewalks. You should only ride on the roadway when no sidewalk is available. Always ride with care. I have never used a scooter before. I am worried that I won’t be able to drive one. scooter. It is really easy, plus, it is not a racing car; you will go the same speed as a pedestrian. How do I know the scooter with the best maneuverability? 3-wheelers are more maneuverable than 4-wheelers because they have a much smaller turning circle. 4-wheelers are generally not suitable for indoor use (home, shops etc) except for the very small ones. 3-Wheelers are a little easier to steer because there is only one wheel to turn. How comfortable will I feel sitting on the scooter? This is a very important consideration. On a 4-wheeler, the front mudguard extends right across the scooter. On 3-wheelers the floor extends forward each side of the steering column so you can stretch your legs forward. Here’s a simple test to see how much legroom you’ll need: Sitting on a 3-wheeler is like sitting in the front seat of a car. Sitting on a 4-wheeler is like sitting in the back seat. If you can’t travel in the back seat of a car because your legs are too cramped up, you will probably need to consider a 3-wheel scooter. What type of scooter is suitable for a hilly area? The steeper the hills in your area, the larger the motor you’ll need because power depends on motor size (not battery size). Small scooters have small motors and large scooters have large motors. So larger scooters are better on steep hills. What is the best scooter for navigating a bumpy terrain? If your footpaths and roads are fairly bumpy then you should have a scooter with suspension, and pneumatic (pump-up) tires. Solid tires have the advantage of being puncture proof, but they can give an uncomfortable ride on rough surfaces. Can I carry these scooters in my car? Most small and medium scooters can be easily dismantled and placed in the trunk of most cars. Most small and medium scooters will fit into station wagons and some hatchbacks without dismantling, except that the seat usually has to be removed. Many people carry a ramp to load their scooter into a station wagon or hatchback. All scooters will fit into vans without removing the seat, provided any van seats don’t get in the way. Scooters and Mobility offers a scooter lifter that will lift smaller scooters into a trunk, station wagon or van. Can I use my equipment in the rain/water? Direct or prolonged exposure to water or dampness could cause your product to malfunction electronically and mechanically. Water can cause electrical components to corrode and the unit’s frame to rust. 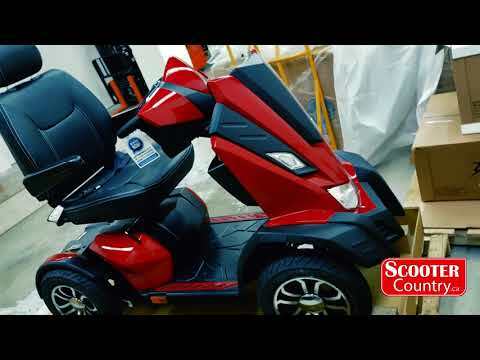 Your scooter or power chair should be examined periodically for signs of corrosion caused by water exposure, bodily fluid exposure, or incontinence. Damaged components should be replaced or treated immediately. Dry your device as thoroughly as possible with a towel. Allow the product to sit in a warm, dry place for 12 hours to allow unseen water to evaporate. Mobility devices that are frequently exposed to sources of water, such as incontinence, should be inspected often for corrosion, and electronic components may need to be replaced frequently. Should I buy a three or four wheel scooter? One of the first decisions you need to make when purchasing a scooter is whether to go with three wheels or four. The four main considerations here are stability, maneuverability, ease of steering and comfort. How will I know the right scooter for me based on my weight and height? Generally, larger people need larger scooters because they have more room and larger motors. Larger motors are more powerful for hill climbing. Taller people often prefer 3-wheelers because they have much more leg room. All scooters have a specified Maximum Weight Capacity which cannot be exceeded without voiding the warranty, but we have scooters rated up to over 200kg! What is the best place to store my scooter? It’s best to keep your scooter inside or in a garage to keep it away from the weather. If you can’t do this, it’s OK to keep it in a carport or other sheltered area, but you should cover it with an all-weather scooter cover. The serial number starts with an S and is located on the seat post. The battery pack may need to be removed.